Hyperallergic Review of "á ùne éa"
I first saw Sean Sullivan’s art at Devening Projects + Editions, when he was included in EXPO CHICAGO 2016. A group of works on paper that had been pinned to the wall, the artworks seemed to exist somewhere between prints and drawings. The drawings — many of which contained closely packed parallel lines, rows of circles, and a stylized Slinky-like scribble — did not remind me of anyone else’s work, which is a rare experience in this day and age. I approach drawing and printmaking as a recording process akin to and inspired by early photography and musical recordings. […] The drawings themselves are relatively simple in structure and execution. They are made quickly with a ballpoint pen, a ruler, and a homemade version of large-scale carbon paper (oil paint applied to paper). The result is a primitive transfer process that “records” in oil paint, not only the intended lines of the drawing, the ideas themselves, but just as importantly, the unpredictable marks of chance. None of this quite prepared me for his first New York exhibition, Sean Sullivan: á ùne éa at Jack Hanley. The show includes drawings, oil transfers on found paper, oil paintings, salt dough sculptures, and found-object sculptures. Many of the works were shown in groups or clusters, meaning the objects numbered far more than the nearly 90 works listed on the gallery checklist. The paintings and multimedia works on the wall ranged from less than 5-by-5 inches to 5-by-4 feet. In the works on paper and board, Sullivan employs a process that shares something with monotype and involves spreading oil paint on newsprint, which is then placed on the surface, often a nearly blank page from a book. His medium is an oil stick with lots of wax in it, giving it — as the company he works for, R&F Handmade Paints in Kingston, New York, likes to advertise — a lipstick-soft consistency. This explains the waxy skin found in many of his works, as well as the amount of control his medium allows, even as he “leaves room for the unpredictable traces of chance,” according to the gallery’s press release. 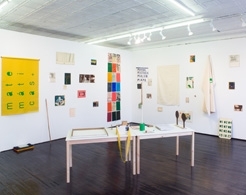 As he conveys in his artist’s statement, Sullivan thinks of his works as “records,” connecting what he does to music and photographic documentation. The title of the show, á ùne éa, is set of phonetic sounds that suggest sense and nonsense without becoming one or the other. I think of the various groupings — each with their own visual vocabulary — as pages from an unknown book. Some works include a letter or two. The word “This” appears. In other works, the his vocabulary of symbols and abstract lines and squiggles can evoke different things, from a blueprint for a fantastic piece of architecture or a complicated Rube Goldberg-like contraption to a stack of evenly spaced horizontal lines – like a sheet of writing paper. In addition to the ruler, Sullivan uses such instruments and devices as brayers and hand-cut stencils, which are apparent in the larger works on hardboard. Because each color requires its own step of applying the pigment stick to newsprint, printing and composition become inseparable. If Sullivan is dissatisfied, he can cover what he has done with a layer of color and see what happens. The process comes across as open-ended and improvisational. In one pairing, “S, A. Inc No.1” and “S, A. Inc No. 2” (both 2018), the letters “S” an “A” are rendered, with a comma between them. Just below these letters, we see “INC.” The letters appear in a rectangle that is slightly tilted in relationship to the paper’s edges. Executed on found paper — most likely pages from a book — these two works stir up all kinds of associations while concurrently coming across as self-sufficient, visually engaging, mysterious works. I read them as concrete poems, as homages to Charles Demuth’s painting, “I Saw the Figure 5 in Gold” (1928), which was inspired by William Carlos Williams’ poem, “The Great Figure.” Photographs by Rudy Buckhardt and Walker Evans, children’s illustrated books, and the Dada sound poems of Hugo Ball all came to mind, as well as James Castle’s soot drawings of letters and symbols and Shirley Jaffe’s abstract paintings full of idiosyncratic geometric shapes and scriptive lines. It is also clear to me that Sullivan has come up with something all his own — that he is taking a singular path. I mention these associations as a way to help define what Sullivan is up to. He is a unique synthesis of book designer and illustrator, concrete and sound poet, visual artist and print-maker. The exhibition is spread out over two galleries in this large second-floor space on the Lower East Side. In the first gallery are clusters of different works on paper, plus the large works on hardboard. His salt dough sculptures sit a table in the center of the room — they look like irregularly shaped cuneiform tablets incised with various marks. Made of flour, salt, and water, salt dough is a modeling material usually used to make Christmas ornaments, and is dried in the oven. The funky homemade vibe of the front room, where the works on paper are pinned to the wall, is magnified in the second gallery, where objects of different sizes lean against the wall, and assemblages have been placed on a long table. In contrast to the sparse hanging of the work in the first room, the works in this room are hung salon-style. “Matemáticas y Música” (2018) is a painting of letters on canvas that hangs down from a horizontal pole, like a window shade. Three rows of letters (“MATE, MATI, CAS +”) are large and oriented sideways, while two smaller words (“Y MUSICA”) are placed in the lower right-hand corner. The orientation of the letters suggests that the pole can be held vertically, like a flag, or horizontally, like a towel rack. His flag-towel is like a manifesto declaring how important of music, mathematics, languages, and sound is to his work. By breaking down words into syllables (sounds) and applying each color (image) separately, Sullivan has opened himself up to taking different routes in any work or group of works he starts. Inspired by Dada, Sullivan has transformed its dark, destructive impulses into something else. At the same time, a photograph he uses of men gathering around their female leader during the French Resistance leads me to sense another current running through Sullivan’s work. I think of this image as possibly possessing talismanic powers for the artist, as a kind of good luck charm that he thinks might be of use to others as well. Perhaps that is why a large sheet of newsprint with this image on it was folded up and placed on the windowsill at the far end of the second gallery. Sullivan was inviting us to touch it, to open it up and discover the image. He was encouraging direct physical contact, as one would rub a rabbit’s foot. 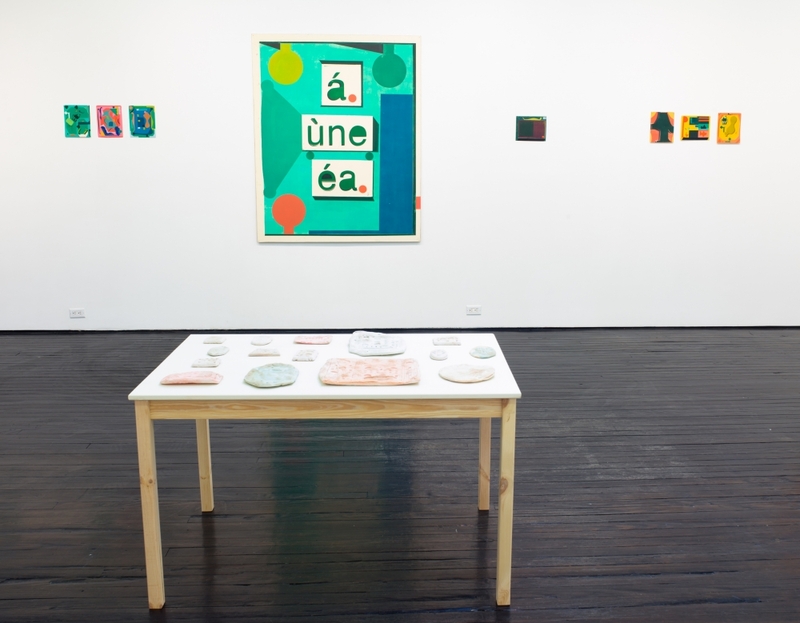 Sean Sullivan: á ùne éa continues at Jack Hanley (327 Broome Street, Lower East Side, Manhattan) through April 15.